a) There was a period when occasionally he would have a dream that he would compare to a supernatural experience of being out of the body, it happened to him about eight times, sometimes he may have drunk too much wine or take some sleeping pills before he went to sleep, and he would sometimes find himself during his sleep going out of his body from his bed, and fly about forty or fifty centimetres off the ground and he would be able to see his feet in the foreground, and he would feel himself go outside the room right through the walls. He was curious about how this worked but never found out. CFQ:Have you ever had a supernatural experience? Conor Creighton: Is there any way that you can control the dreams and manipulate your surroundings from within the dream? 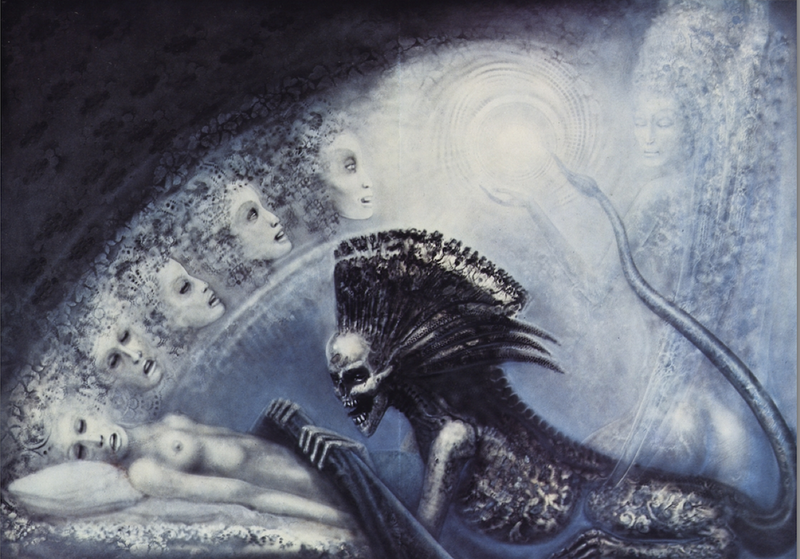 HR Giger: Yeah sometimes it happens and I can remember when I’m in a dream. Or I get the feeling like I’m out of my body. A long time ago, about 10 or even 20 years ago, I had that. But it didn’t happen to me often. Probably four or five times but yeah, that was strong. Conor Creighton: Was it frightening?